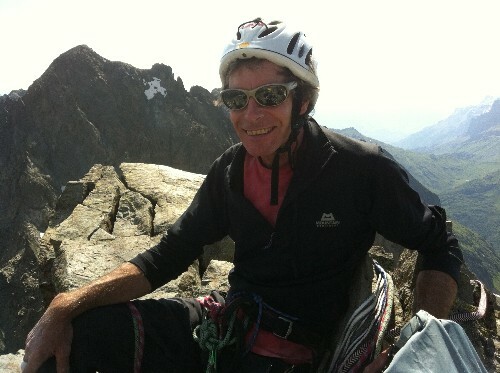 Before I left Chamonix, I was able to have a last supper with my friend, artist and alpine climber Andy Parkin. 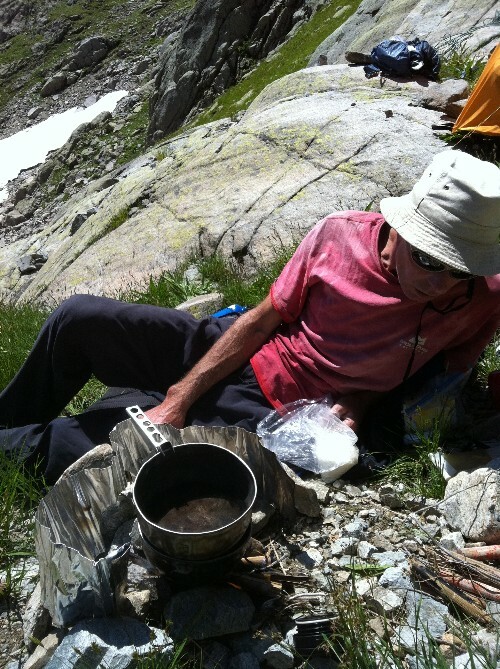 Over the years that I’ve known him, he’s told me some pretty out-there stories…mostly about defying death in the mountains, but also about other rip-roaring adventures, too. I’ve never officially interviewed Andy, so when I thought about interviewing him to write a Q&A article for the About.com Survival Skills site, I knew we’d just sit down and talk. I asked him to tell me his best survival story, and I also–for the first time–asked him if I could take notes so that I could write about it. He didn’t object. But he talks so fast that I found myself scribbling wildly to keep up! At first, Andy tossed out a few ideas–outsmarting a storm while trying to climb a new route on Patagonia’s Cerro Torre with Francois Marsigny, a similar solo survival experience on Fitz Roy, a very grim Christmas with Victor Saunders on Shishapangma. He settled on telling me about Cerro Torre because he said that it was the one that’s inspired him the most to survive other (maybe even worse) things in the years that followed it. I took eleven pages of notes for what should have been only a 600-word article. I wrote more than double that, and the article doesn’t even come close to the detail he gave me or the detail I would have liked to share. 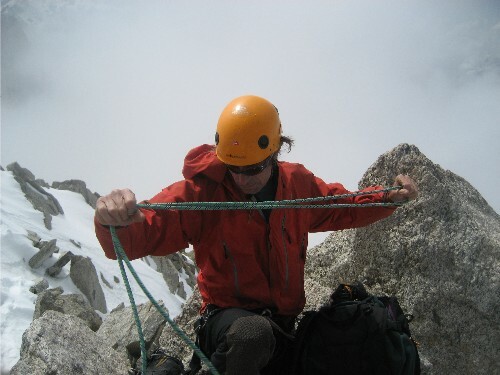 But I realized a few things while talking to Andy about Cerro Torre. First of all: I’d heard lots of bits and pieces of this story over the years, but hearing it like this all at once finally gave me the kind of satisfaction I imagine I’d get if I’d just put together a humongous jigsaw puzzle. Secondly: I’m glad, so glad he’s alive to tell me these stories. 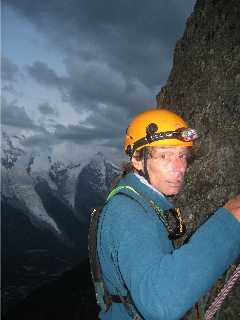 What to read Andy’s tale of survival on Cerro Torre? When All’s NOT Well? Improvise! See the items on the right? 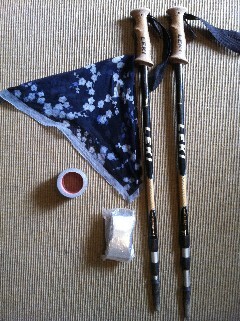 Trekking poles, an emergency blanket, some duct tape, and a silk scarf. Imagine yourself stranded in the backcountry with only these items in your backpack. After you’ve cursed and then forgiven yourself for going out into the outdoors horribly unprepared, how could you use these items to survive a desperate situation? Leave some comments below with your ideas, and if you’re utterly stumped, see my article on the About.com Survival Skills website titled “Survival Improvisation: Craft Improvised Tools and Gear,” which uses these four items as examples of how to use common items for new or creative purposes in outdoor survival situations. Survival improvisation is more like a mindset, and it requires practice. But when you’re practicing something new, be prepared to fail. Then regroup and revise your approach. Share your experiences with friends, and learn from the experiences and advice of others. 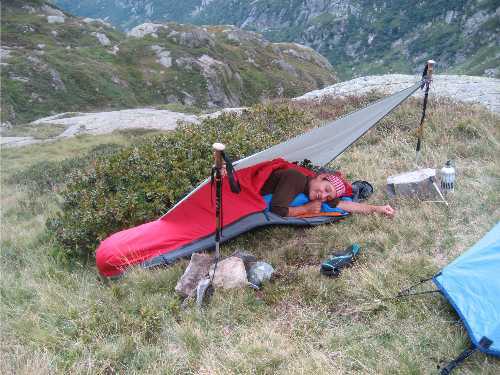 Just in case you don’t believe me–about the trying and failing part–I wanted to share an experience in which I practiced making an improvised shelter in the Aiguilles Rouges, near Chamonix, France. 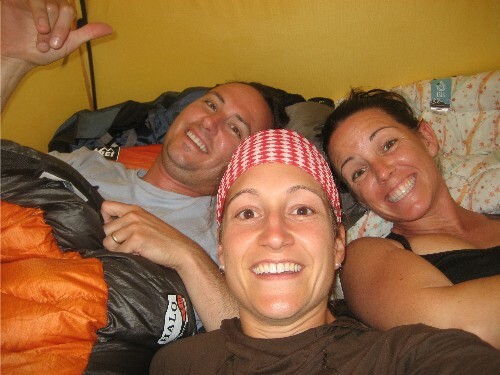 …and even though it was more of a two-person variety, I hoped in and curled up into a ball and slept at their feet, cramped and uncomfortable–but at least dry. I guess you could say that my improvised shelter was a great big FAIL in this instance. However, if mooching off of your friends counts as survival improvisation, then I did a great job here! 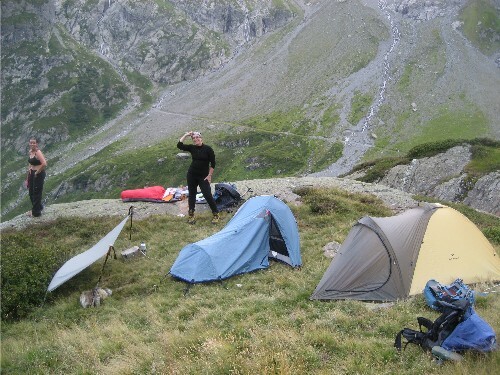 Want more ideas about how to improvise in the outdoors? 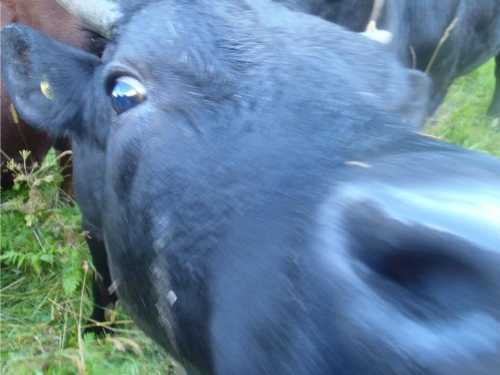 Moooooooove: What to do About Aggressive Cows? Right. So. 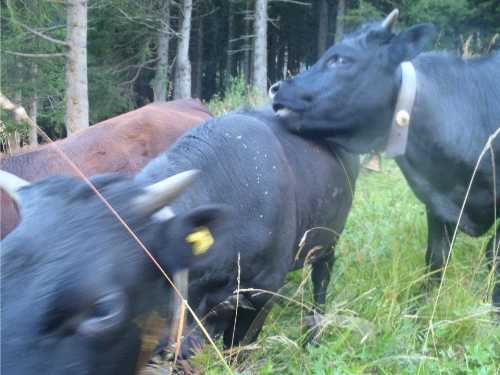 This is really embarrassing to admit, but I turned around recently on a long mountain bike ride because I felt threatened by…a herd of alpine cows. 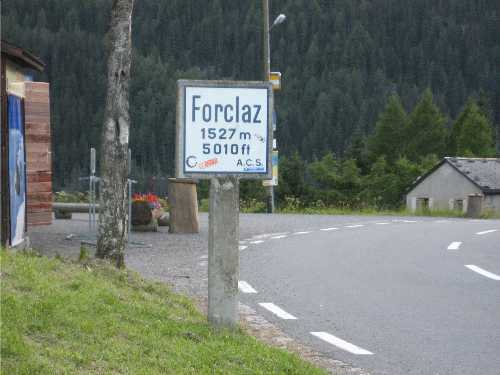 The incident turned a three and a half hour mountain bike ride into one that lasted nearly seven hours. I arrived back at my apartment in the dark, shaken and hungry after eating only two sports bars throughout the ride. Here’s what happened. 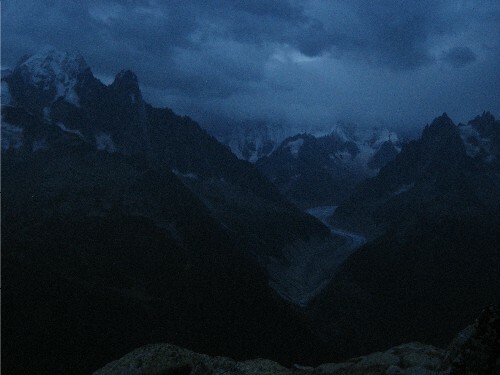 I planned to ride from Chamonix, France to Champex, Switzerland to stay the night at a mountain hut and visit my sister, who was hiking the Tour du Mont Blanc. But as I was traversing a steep and rocky slope, I came into an area with two ravines in close succession, and a herd of cows was stationed there, all over the trail. The cows were huge. They had big horns, and they were acting aggressively towards each other, butting heads for position and making threatening sounds. When I cruised up on my bike, they turned towards me and began rushing in my direction. The cows all pictured above are small in comparison to these cows–I was so scared that I didn’t want to hang out and take photos. Once they started rushing towards me, I dismounted my bike and tried to hike high above up the first ravine to avoid them. 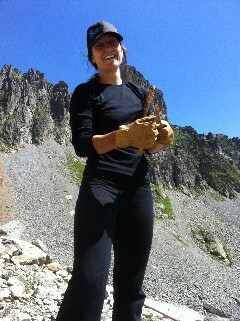 But the two ravines made the terrain steep, rocky, and wet. I bushwhacked up through gnarly roots and rocks, and I crossed the first water source, which ran over slippery and rubbly rocks. I couldn’t continue on such a high course, so I had to hike down, and when I got close to the cows, they again rushed towards me. I tried to hike up and around them for a second, and then a third, time. 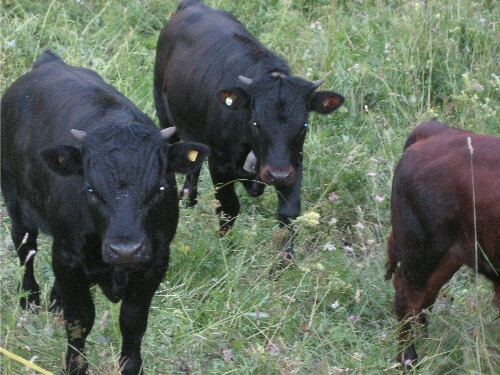 But each time I had to descend in order to get through the terrain, the cows blocked my progress. They would not disperse when I raised my arms or encouraged them to move off the path as I had done successfully with other alpine cows. I feared that they would trample or gore me, and I didn’t have anyone else with me to help me out. So–I bailed. I rode home the whole way wondering if I’d wimped out. I mean–could these cows really have hurt me? I got that not-right feeling from this herd and trusted my instincts, but the experience left me wanting to know more. After doing some research about aggressive cows and cow attacks, I realized that they could have harmed me. 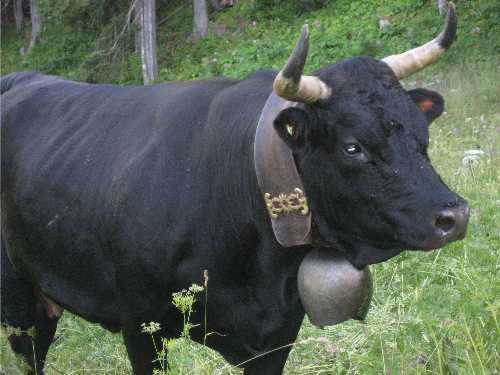 In an attempt to share the information I gained from this experience, I wrote an article for the About.com Survival Skills site: “How to Survive an Aggressive Cow Attack.” Read…and enjoy! Want to know more about how to get cows to MOOOOOOOOOOVE? Photos © Shawna Macnamara and Traci J. Macnamara. I recently rode my mountain bike around the Mont Blanc massif here in the French Alps–a solo adventure that involved mountain biking 100 miles of alpine terrain in two days. 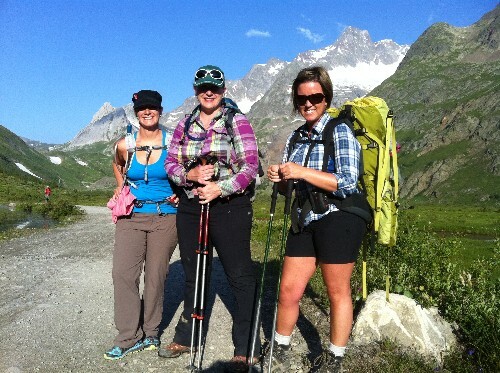 I’d been wanting to take on this challenge for several years, and I finally got motivated to do it in order to meet up with my sister and her friends, who were hiking the Tour du Mont Blanc (TMB). 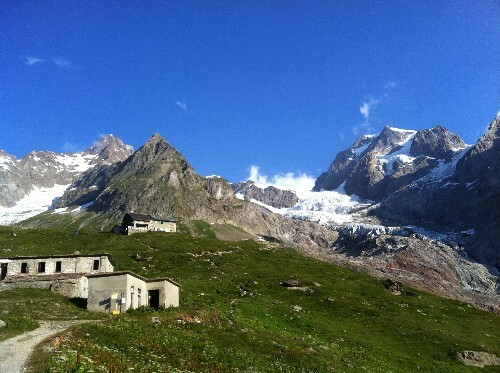 The TMB is an amazing hike of just over 100 miles; it’s a circuit that people usually start near Chamonix, France, hiking during the day and staying in mountain huts and bed-and-breakfast-type places along the way. 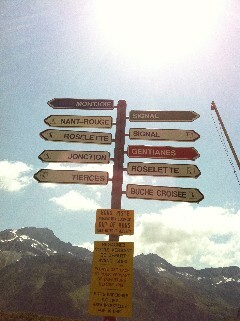 The trail goes up and down and up-up-up-down-down-down through France, Switzerland, and Italy. 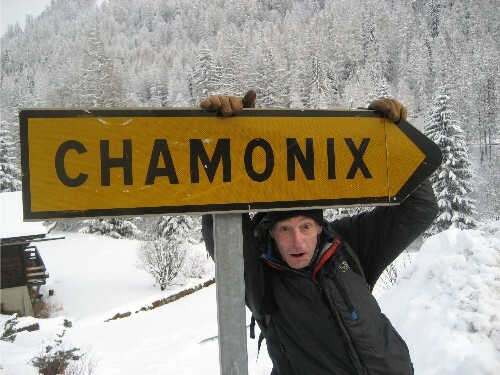 I left Chamonix on Day One, riding my mountain bike away from my summer living quarters with a tiny backpack on my back. By the end of the day, I’d spent 10 hours on my bike, descended some excellent terrain, and ridden over a big road pass in the hottest part of the day. I met my sister and her friends at the Rifugio Elisabetta in Italy, arriving at 8:00 in the evening after sprinting over a big mountain pass, pushing my bike to outrun a storm. I was super excited to see my sister and her friends, who were completing the third day of their twelve-day journey. We shared some Italian food and wine together but then went to bed early so that we could get up and get back out on the trails early again the next day. 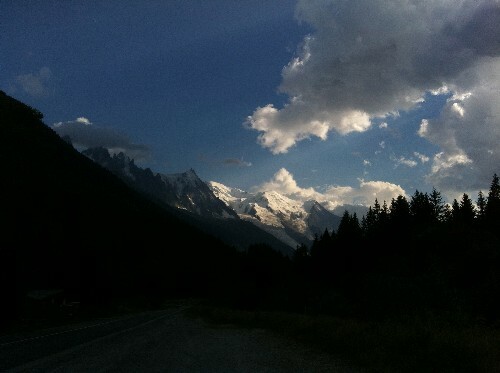 I walked my bike for a bit in the morning to chat with my sister while my body woke up, but then I knew I needed to ride so that I could make it back to Chamonix before dark. I had to bust out my mental Kung Fu to make it back to Chamonix, even though I’d done everything to protect myself in the heat, including resupplying my water frequently, eating the right food, wearing sunscreen and appropriate clothing, and cowering in the shade when I could in the hottest parts of the day. The experience in the heat on the second day of this trip, especially as I climbed up from Martigny, inspired me to write an article about surviving hot climates on the About.com Survival Skills site, so check out the link below to read more on that topic. What to know more about surviving superhot temperatures? I might be bad luck when it comes to camping stoves. 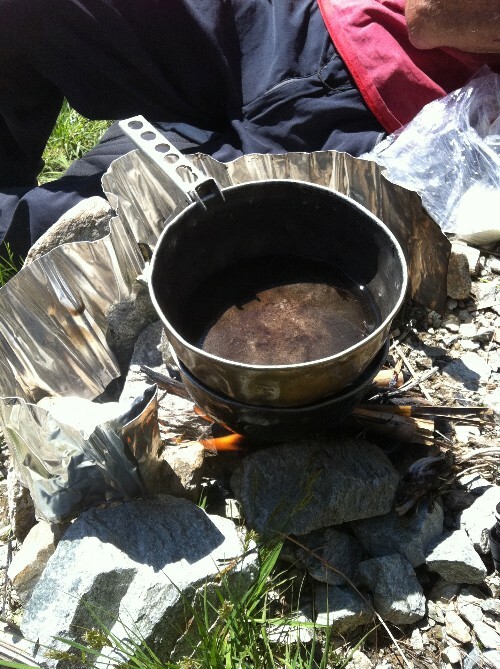 The last two times Andy and I took a stove into the mountains on overnight climbing ventures, we ended up building a fire to boil water. The first stove somehow got a “hairline crack” somewhere, according to Andy, and I don’t know what happened to this one. I don’t even know if it’s legal to build a fire in the areas where we were climbing…but Andy’s English and he can’t function without tea in the same way I can’t function without coffee. So, we built wee little fires to cope. 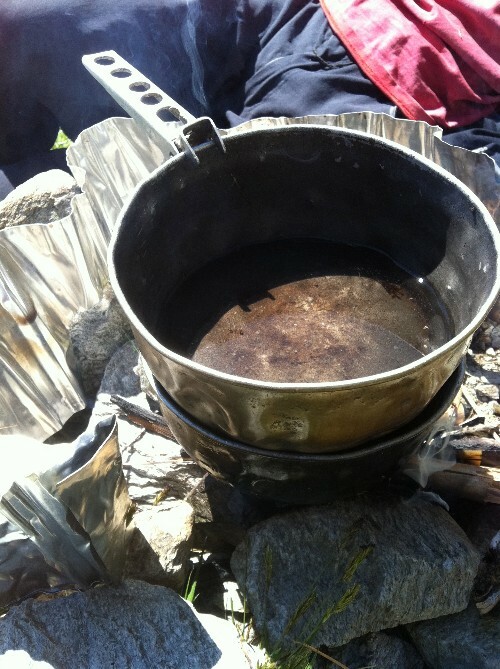 In last week’s most recent stove incident, we’d survived a wicked lightning and hail storm overnight and think maybe the stove went kaput because it got wet. In order to build the fire, we did our best to find dry tinder and kindling by digging around for rhododendron twigs and roots. We’d also spotted some discarded bamboo route markers and gathered them up for fuel, in addition to the kerosene we brought along to fuel the stove. We added increasingly bigger chunks of kindling and then the bamboo pieces until we had little flame, and–finally–a good fire going. And–voilà–in a few more minutes, we had boiling water…and warm mugs of coffee (for me) and tea (for him) in our hands. For more about how to build a fire in the backcountry, click here to read my article titled “Basic Fire-Building Techniques” on the About.com Survival Skills site.